With fat slick tyres and a diffuser of epic proportions, the rear end of this 3-series is fantastically aggressive! We love watching hill climb videos. The sport is filled with such a ridiculous variety of bonkers cars, you never know what bewinged beast might show up next. Perhaps it’ll be an Audi R8 powered by an inline-four, or a VW Polo that revs to 10,000rpm. Whatever it is, it’ll almost certainly be exciting. Just look at this E36 BMW 3-series. It apparently started life as a humdrum 320i, but there’s not a whole lot of that car left. 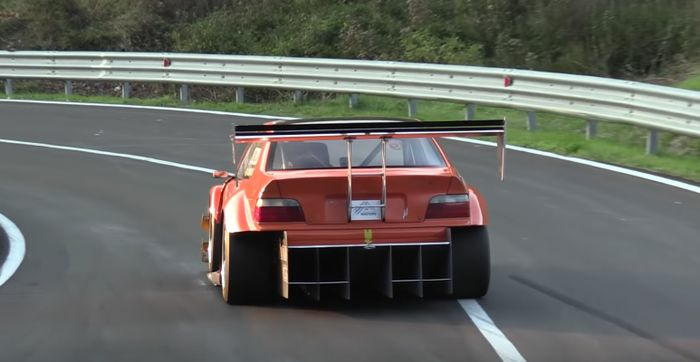 We now have huge rear wheels shod in slick tyres, arch extensions to accommodate the wider track, a giant rear wing, and a Cosworth YB engine belting out an anti-lag-heavy soundtrack. That’s the engine Ford used for the Sierra Cosworth, by the way. Our favourite part, however, has to be the rear diffuser. It’s almost comically large, and along with those fat tyres, wider arches and the rear wing, it gives this car one of the most aggressive-looking rears of any 3er we’ve ever seen.